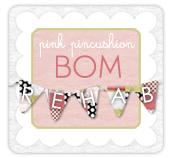 Cupcakes 'n Daisies: BOM Rehab . . . . It's BOM Rehab Monday, thanks again to Sinta, the BOM hostess with the mostest. I'm still managing to get one Northern Lights block done a week, I think this is my third straight week! 3 focus blocks done, 4 more to go! Here's this block nesting in the middle of the setting blocks. A couple of folks have asked me if I miss working with color, but since I'm only making one block a week, so far, the absence of color has not bothered me. Maybe that's the secret, I can go one day without color in my sewing room. Remember when French General by Moda was first out, and how I went on and on about the great selvages? I've got bags full of French General selvages. But as of late, those beautiful selvages have been annoying me. I do this at least once on every block. 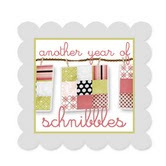 I'm using Marti Michell templates to make these blocks, hey it looked just fine on the front layer of fabric! For more information on my Northern Lights project select Northern Lights from my Categories list on the right. They are really looking lovely... so soft and calming. Keep up the good work! The neutral is very pretty and will make a lovely quilt. I have always taken issue with the width of the FG borders, as well as other lines by other designers who have, of late, been making the selvages so wide. I feel like I am getting gypped out of usable yardage. Not a good feeling when fabric is so expensive any more! I agree, these blocks do look soft and calming, I have made one neutral quilt but it moved to Texas with my daughter. Maybe it's time to start thinking of a new one. Love this quilt with the neutrals! It will go in any room. The Hubbel in the post below is so cheerful and looks like fun! I like the way you renamed it :) I am way behind on blogging so off to read more of yours! The neutrals are looking so pretty! And the Hubbel is looking lover-ly as Eliza Doolittle would say! They are so different from each other, but of course you are making them both fantastic. LOL! I'm glad I'm not the only one who gets into selvages accidentally. The neutrals are gorgeous.